Pat Philip has celebrated Christmas on three continents in cities and climates far removed from her childhood home on the Philip ranch in British Columbia. Fortunately she’s adventuresome and adaptable. Early in her career Pat worked in hospitals in Oshawa and Ottawa. As junior staff she had to work on Christmas Day, (for triple time), and her quiet celebration was at the home of a friend. Once when working in Ottawa she flew home for a fast Christmas visit. That New Year’s Eve, back in Ottawa, she walked up to Parliament Hill to admire the lights in Canada’s capital. One Ottawa Christmas she went to a party in a room in the Arts Centre. In New Zealand she was scheduled to work Christmas Day but remembers “I made sure I had three helpings of strawberries and cream to compensate!” Another New Zealand Christmas dinner was an outdoor barbeque at the home of one of the doctors. In 1979 Pat was working in Australia, where she went to a midnight church service in her summer clothes. All the windows in the church were open and the carols rang out in the starry night. That year, in thirty degree weather, she enjoyed a traditional Christmas feast at her cousin’s house. Weather wasn’t so toasty in Canada. When Pat phoned to wish her family a merry Christmas her dad wasn’t sure if sister Lesley could make it up home through roads that were all snowed in. In 1988 Pat went to Japan to teach English. There she met and, in 1993, married Rioji Maeda, whom she describes as ‘an independent-thinking non-conformist with a degree in fisheries biology from Humboldt University in California’. Pat, Rioji, and their son Shohei live in Kamakura, Japan. In 1992, before they were married, Pat did convince Rioji to go hear a pipe organ concert of Christmas music in a symphony hall in Osaka. “It’s amazing what they’ll do for you before you’re married!” In 1999, when Pat’s mother was visiting, they attended another concert of Christmas music in Naru Park, in a Buddhist temple which had been converted into a church. Christmas is not important in Japan. Japanese decorate some stores with Christmas decorations, but Christmas is a regular working day. Rioji mostly works at Christmas. New Years is the more important ritual. Old obligations must be cleared up. Everything gets cleaned. Gongs are beaten to drive away malevolent spirits. People want to make their first visit to a shrine and New Year’s cards are delivered on New Year’s Day. There is a weeks’ holiday starting Dec.29th, but it’s more somber than the western Christmas. It’s a great contrast to Pat’s childhood Christmases with snow, trees, lots of family, decorations, and presents; all the mystery and sociability of the Canadian festival. There was usually a Christmas concert at the one room Long Lake school. Sometimes education mixed with entertainment, as it did the year there was a song about each province. Pat remembers “The Red River Valley” as her contribution. Each child was expected to participate. They weren’t expected to improvise, but Pat didn’t realize that the evening she got up on stage and began to tell the attentive audience all about her trip to Vancouver. With six children in the family, the Philips were quite capable of getting together their own entertainment at home. One year they performed ‘A Christmas Carol’. A realistic re-enactment of the Nativity another year, featured Pat as director instructing Mary, “Grunt! Groan!” 4H kids were extremely practical about birth. Their understanding of life’s events didn’t interfere with the magic of Christmas. Pat looked out the window, wondering just where Santa Claus was, flying all over the earth. Once she told her mother, Connie, that she could smell Santa Claus’ pipe, remarkable, since no one in the family smoked. He always came for the cookies they left him; that seemed like evidence. The children shared their anticipation between Santa and Eaton’s Christmas catalogue, both magical givers of gifts. Dad, Warner Philip, always got the tree from their own land. It was put into the decorated living room and hung with green and red paper chains and popcorn chains. The year the cat climbed the tree, toppling it, a few of the decorations met their end. If the weather was good, the Philips family went to the Christmas service at the United Church in Kamloops and family from town came out for Christmas dinner. Everyone dressed up for dinner. There was Christmas cake, crackers to pull, family visiting and jollity. If the roads were blocked in, the family stayed home, quite self-sufficient on the ranch. There might be twenty- four people for Christmas dinner. After dinner, the children entertained with their play or pageant. “The first year there was TV people sat like zombies watching the idiot box!” Pat still feels indignant. Pat, Rioji and Shohei have visited the ranch often, but mostly in summer. Shohei was six years old before he spent a Christmas there and went out with his grandfather on the tractor to feed the cows on Christmas Day. Feeding cattle is more mechanized now, but it still has to be done. It was the first time Shohei was really in contact with snow in any amount too. This past year, 2008, Pat and Shohei have been living in Kamloops so that Shohei can go to school in Canada. They’re spending Christmas at the ranch again. The family is scattered now, not as many relatives will be gathering. 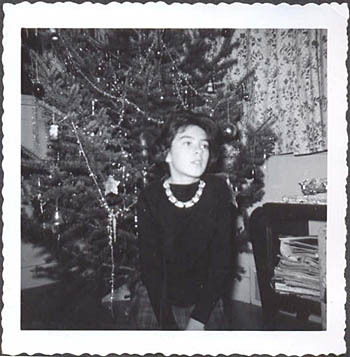 Pat says she enjoyed Christmas more as a child, or when her son was small. And “It’s not the same with Dad gone.” Warner Philip died in 2005.